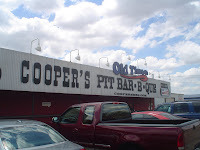 It had been some time since my last visit to Cooper’s in Llano. This haven for bikers out on their Saturday stroll isn’t on the way from Dallas to anywhere, so I made a special road trip of my own. There was some BBQ sampled along the way, but my true destination was Llano, and the original home of the Big Chop. Although when I set out for the day I had plans of an all out gorge fest, but once I hit Llano I was four joints deep on the day and could only muster a measly order of brisket and a pork rib. I just couldn’t bring myself to spring the $15 or so it would take for just a few bites of the Big Chop, but I ended up with quality over quantity. I’ve had my issues with oversalted and undersmoked meats at this and other Cooper’s locations in the past, but the original was on their game for this visit. The thick slice of brisket was perfectly cooked. The seasoning was intense, but the small surface area to meat ratio helped temper it a bit. A bit of fat clung to the end of this thick slice and it made for one happy mouthful. While this cowboy style of BBQ doesn’t ever result in deeply smoky meat, there was at least a solid hint of smokiness in the meat. Pork ribs were also good, if not as tender. The seasoning is more subdued, and the smokiness shines a bit more on the ribs although don’t expect a thick black bark. The best item of the day was new for me at Cooper’s. A nice bark had formed on this giant beef rib which I only got to taste after meeting a biker couple sitting opposite me at the picnic tables. Rosie was kind enough to share a few bites of this beefy rib, and the meat pulled easily from the bone. Each bite was infinitely moist, nicely seasoned and perfectly cooked. It was one of the better beef ribs I’ve eaten. The only Cooper’s item that may equal it is the blackberry cobbler. This was simply exquisite, and a perfect ending to a great meal that further filled my already distended stomach. While a bit on the expensive side, those beef ribs are great, and the blackberry cobbler is out of this world. I haven’t found its equal. Okay, let’s settle the debate. Who, in your opinion, BBQ Snob, has the best open-pit bbq: Pizzitola’s in Houston, the Hard 8 in Stephenville, the Cooper’s in New Braunfels, or the Cooper’s in Llano? I could be wrong, but I’m guessing you’re gonna say Pizzitola’s because of the wood factor. I’d say Pizzitola’s hands down, but I hate the term “hands down”, so I’ll just say Pizzitola’s. They were inches from five stars.A point of clarification is that they aren’t all done in the same style. Pizzitola’s still uses wood rather than all coals like Cooper’s and Hard 8, so the smokiness is pronounced. After visiting Cooper’s for the first time ever (New Braunfels), I’d say it’s a great place to get a sample rib for eight hard-earned dollars. Did I say one rib? Yes! Only one beef rib for eight hard-earned dollars! Plus enough fat on it to leave you coughing up phlegm the rest of the night. At least you get to have all u can eat beans that are out of this world. Well, I’m not going back to Cooper’s ever again, but it’s a good way to sample some great bbq, before finishing off at Rudy’s or somewhere else that really wants you to have a good meal, without tapping into your savings account or something, ya dig? Don’t get any sides, they’re all overpriced and none of them are better than the all u can eat out of this world beans! I give it a one star rating out of five. That’s one star, because of the poor value for one’s hard earned dollars.